The breathtakingly beautiful Savannah calls out to that part in us that wants to break free and explore all that is adventurous and untamed. Though having the look and feel of a large exotic cat, Savannahs have the temperament of a fun loving and affectionate family pet. Who hasn’t gone to a zoo and been awed by the majesty of a large cat? One can’t help but to be taken back when contemplating the royalty of a lion, the prestige of a tiger, or the wit of a leopard. With a simple gaze into their eyes you will find yourself pondering the mysteries that they hold and the possibilities of the unknown. 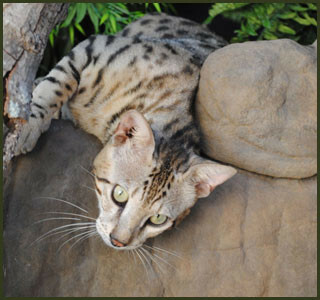 If you have a knack for the extraordinary we challenge you to experience first hand the prowess and prestige of a Savannah Cat. 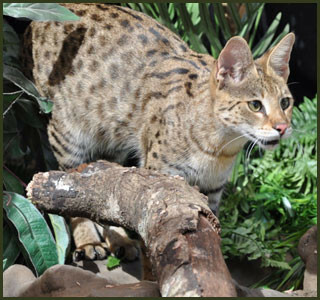 For those people who want to go beyond the ordinary and bring a Savannah into their homes to experience first hand the amazing intelligence, energy, grace, and beauty of a savannah companion, we welcome you into our website! 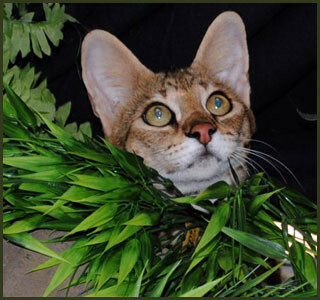 We believe that to produce the highest quality Savannah Cats you must start with the very best for your breeding program. 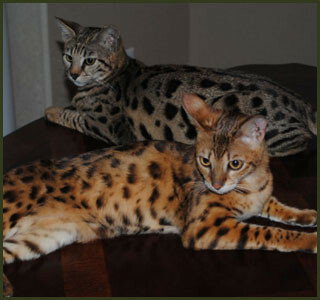 We breed only the highest quality Savannah Cats to Savannah Cats and Servals to Savannah Cats. Majestic Savannahs can proudly claim that all of our F4 and F5 generation cats are SBT. We do not introduce any other pure bred cats into our lines. 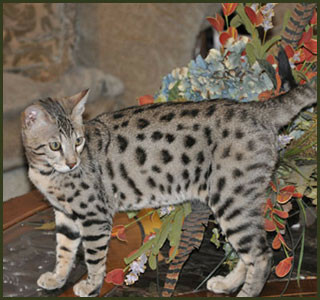 This ensures you a Savannah Cat consistent in appearance and temperament. 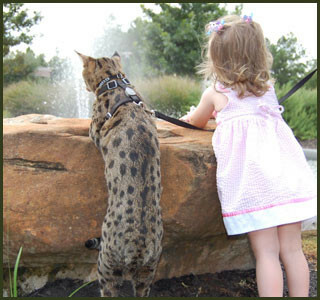 We can guarantee your savannah kitten will come to you well socialized, litter-box trained, and ready to be a member of your family. 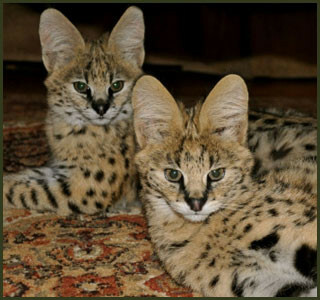 “F” designations in Savannah Cats tells us how many generations removed from the African Serval the Savannah is. The designation is determined by what the Savannah’s mother’s designation is. Example: F2 mother bred to F5 male will produce an F3 kitten. 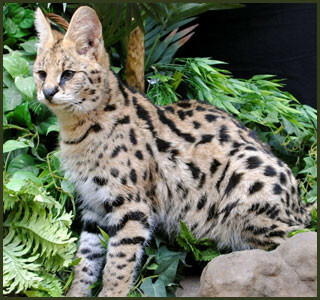 The kitten is one more generation removed from the pure Serval than is the mother Savannah. 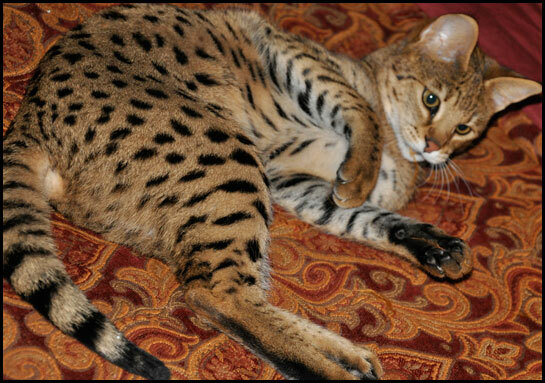 The “A”, “B”, or “C” designates how many generations of Savannah Cats are in the pedigree of a particular cat. 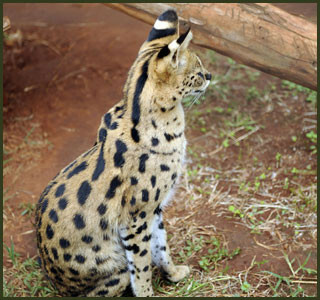 The SBT Savannah is at least 4 generations removed from the Serval but is a “pure Savannah” having only Savannah breedings for at least 3 generations. This is advantageous as the SBT is more consistent in type, size, and his or her temperament can be predicted easier. All photos and information on this website are copyrighted and the property of Majestic Savannahs and may not be duplicated.